This map shows the 10 countries/territories with the highest diabetes prevalence rates in adults aged 20 to 79, in 2013. On World Diabetes Day, news about the disease's global impact is dire. An estimated 382 million people worldwide have diabetes, according to a new report from the International Diabetes Federation. The IDF expects that number to rise to 592 million by 2035, when one in every 10 people will have the disease. "Diabetes in all its forms imposes unacceptably high human, social and economic costs on countries at all income levels," the report authors begin in the executive summary. They go on to say that this latest edition of the Diabetes Atlas "carries a bitter but unavoidable message: despite the array of tools at our disposal to tackle the disease... the battle to protect people from diabetes and its disabling, life-threatening complications is being lost." Epidemiologist Leonor Guariguata, project coordinator for IDF's Diabetes Atlas, wasn't surprised by the report's findings. In fact, she says the estimates are conservative, and that diabetes may be a much bigger problem than we think. "The thing that strikes me is that we keep saying the same thing again," she said. "Every time we produce new estimates, they are above and beyond what we had projected from past estimates." There are three types of diabetes: Type 1, Type 2 and gestational diabetes. People who have Type 1 diabetes do not produce insulin, a hormone the body needs to convert sugar and starches into energy. Type 1 diabetes used to be called juvenile onset diabetes because it is usually diagnosed in adolescence. Around 5% of the diabetic population in the United States has Type 1 diabetes. People with Type 2 diabetes have developed a resistance to the insulin their body produces. Most people who develop Type 2 diabetes are adults, although experts worry about the increasing number of young people being diagnosed. Gestational diabetes occurs during pregnancy and can increase both the mother and baby's chances of developing Type 2 diabetes later in life. According to the IDF report, China, India and the United States top the list for the most cases of diabetes per country; around 24.4 million Americans had the disease in 2013. But islands in the Pacific have the most alarming rates of prevalence, or the number of cases compared to the country's population overall. For example, 37.5% of the population of Tokelau, located northeast of Fiji, has diabetes. 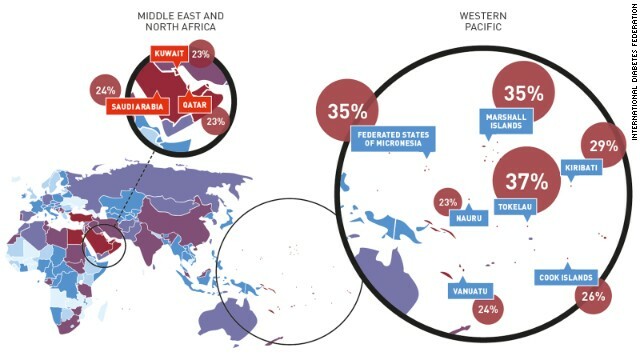 Micronesia, Saudi Arabia, Kuwait and Qatar also reported higher-than-average prevalence rates. A large part of this is due to the growing obesity problem; while all types of diabetes are on the rise, the number of people with Type 2 diabetes is expected to double in less than 25 years. "We started seeing big increases in prevalence in those islands maybe 20, 30 years ago," Guariguata said. "That coincides with rapid development." The discovery of natural resources on the islands, she explained, led to an influx of money in the population. People started eating more imported foods and moving less. But diabetes is no longer considered just a rich man's disease, Guariguata said. Approximately 80% of the people living with diabetes are in low- and middle-income countries. The Middle East and North Africa currently have the highest rates of adult diabetes prevalence compared to other world regions, according to the report, but Africa will see the greatest increase in cases over the next two decades. Urban centers in Africa are showing higher prevalence rates than cities in Europe, Guariguata said, and many cases go undiagnosed and untreated because of a lack of awareness in these countries. In addition to those that already have diabetes, IDF estimates 316 million people have IGT, or impaired glucose tolerance - also known as prediabetes. These are people at a high risk of developing the disease. "There is no country that has solved the problem for diabetes and no country has gotten it right," Guariguata said. "The good news for all of this is diabetes is imminently treatable, with cheap generic drugs that are available and (with) lifestyle change. We're not looking at a disease that we have absolutely no response for." Diabetes is spreading because junky processed foods full of sugars, simple carbohydrates and artificial ingredients are saturating the markets. And you can thank countries like the USA - where chemicals, artificial flavors, artificial colors, fillers, MSG, and poisonous calorie-free sweeteners are pumped into an unsuspecting public - for spreading these foods and the technology to make them. Interesting to note how the incidence of diabetes follows parallel to the increased consumption of "supplements". These drugs are sold to the most over-nourished populations and it is over-nourishment that causes diabetes. There is no worry at least getting diabetes as there is one herb called Cat's Whiskers herb which can effectively reduce the blood sugar level to normal level. This has been proven for more than 10-20 yrs and yet sadly 99.9% of the westerners still think that herbs can cure cancers and diabetes are nonsense. Maybe ramadan is not so healthy after all. SRS CNN HEMOS CONCLUIDO NUESTRA INVESTIGACION. MAÑANA COMENZAMOS LAS DENUNCIAS INTERNACIONALES EN TODOS LOS PAÍSES POR EL USO DE TECNOLOGIAS INVASIVAS. NOS TIENEN INTERVENIDAS LAS PAGINAS. COMENZAMOS EN VENEZUELA CON POLÍTICOS E HIJOS CON LOS QUE HEMOS TRATADO DE CONVERSAR PARA QUE SUS PADRES DEJAN DE REALIZAR ESTOS CRÍMENES. MAÑANA EL MINISTERIO PUBLICO DE VENEZUELA NICOLAS MADURO E HIJOS. POR GENOCIDIO Y VIOLACIONES EN EL CASO LEON. have blood vessel problems affecting your heart, brain, or legs. The majority of middle age Americans have at least some of these risk factors and since we now live longer the greater chance of sooner or later picking up a few more.....So how can these factors be mitigated? As a parent of two kids with Type 1 diabetes, I greatly appreciate how the author of this article clarified the difference between Type 1 and Type 2 diabetes. My kids are thin, active, healthy boys...but they are insulin-dependent for the rest of their lives. So often people mistakenly think that because of diet or lifestyle choices, type 1 diabetics developed the disease. Nope, not true. Also note how the article mentions that ONLY 5% of diabetics in America have Type 1, which is an auto-immune disease with no cure. That reminds us that the remaining 95% of diabetics have Type 2, which–though there's no official "cure"–CAN be managed with diet and exercise. Cut out the processed sugars and starches. Don't eat a bunch of bread and pasta. Stick with the good stuff. I am also a parent of two kids with TYPE 1 diabetes – an autoimmune condition. I agree with your post completely. Many people assume that TYPE1 diabetes is caused by eating too much sugar and processed foods when that is completely false. Too often articles don't differentiate between Type 1 and Type 2 diabetes. Did Leonor Guariguata really say "imminently" treatable? Or is this just defective reporting? Otherwise an interesting and alarming article. A person with Type 1 diabetes is not a "diabetic", just as a person with epilepsy is not an "epileptic". A person with a chronic disease is not "the disease" , yet it is still used to categorise and label people. Granted the article has many good references, but it lacks the understanding of each diabetes type in its writing. I am always wary of those who use statistical data ... as can be seen in this article. Commonly, statistics are used as a fear based method to make people "good" with their diabetes, as many of them must be "bad" with their lifestyle (re: type 2 diabetes). This could not be further from the truth and I am always encouraging people to keep an open mind when comparing 'statistics' with their own life. Education is vital when it comes to diabetes, and it is highly encouraged to become an expert in your own right. Granted, diabetes 'may' cause a shorter lifespan to many people, but we must remember ... less than 100 years ago, diabetes was a guaranteed death sentence. So many correlations could be made here. One thing is for sure, type 2 diabetes will continue to spike as long as Psychotropic Medications are prescribed. Actually my cousin sister is also suffering by diabetes and i know how much it will take prevention. My parents already hired one male doctor he is very nice men they always care to my sis..and his services you can see more to this website http://www.absolutehomecareinc.com/services.html , which i think vital for everybody who care of ownself. Diabetes is really become a very critical Disease for the world.We really need to Control it.And the personal awareness is the only thing which can solve this. I have read a few of your blogs and they all are pretty useful. Thanks for the help. Get organizations ready to present you with the time you will need. A company should certainly give you their particular banners and ads, words, and recommendations. Firms that give education on how to greatest utilize these strategies are the type to work alongside, because they assist generate the most earnings that will help you along with your income. Surprisingly, your entire credit score also impacts your automobile insurance rates. So if you wish to discover cheap, quality vehicle insurance, one particular method for you to spend less is usually to tie up up all those loose stops together with the loan companies. Insurance plan is all about chance, and someone with poor credit normally positions a greater threat. Resolve your credit score and you could save real cash on your insurance coverage. Curled lashes can make the eyes seem even bigger and much brighter. As an alternative to making use of your eyelash curler just when for every eyes, contain the curler sealed around the lashes for fifteen moments. Do this again step on every eyes three individual times – once every single for your basic, midst, and tips in the best eyelashes.